The Little Whisk & Co: The Bar Counter. Good morning to you all - today I am sharing one of my ultimate snack bars that I have recently discovered and am absolutely in love with! Some of these photographs are inspired from The Bar Counter's Instagram account, so make sure you head over on over and follow for updates and photographs that will certainly make you tempted into buying a secret stash. 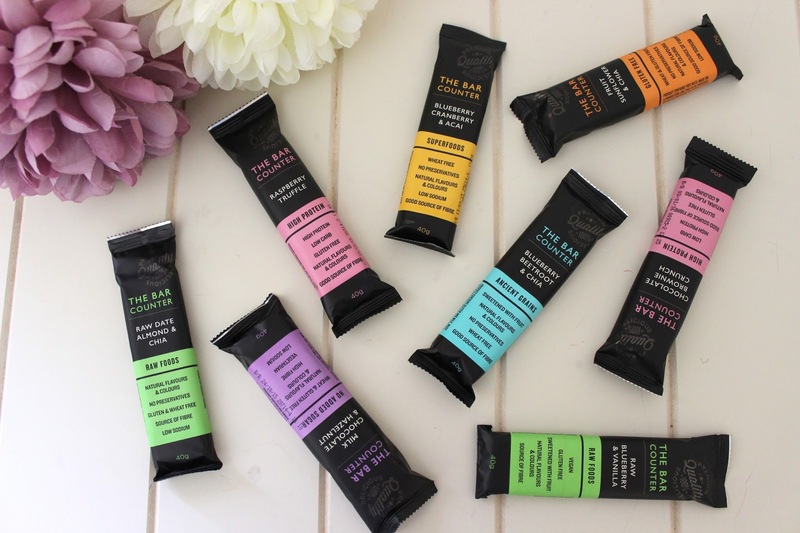 The Bar Counter have created a delicious and wide range of bars that are perfect for an after the gym snack, a sweet treat or a 3pm pick me up - they are an ideal size to slip straight into your handbag. The different type of bars cover raw foods to gluten free to no added sugar - all of which are made with the best combination of ingredients and flavours. Even some of the extreme flavours are delicious and packed with 100% premium quality and delight! The Raw food bars are perfect for vegans as they are filled with only natural ingredients - meaning on natural sugars and carbohydrates. All of the bars have a written outline of all the benefits on the front packaging, so that it is easier for the customers to understand all of its advantages. As always, I can only talk so much positivity towards these snack bars until you actually try them for yourself and your life will be changed. The bars are available in Coles down the health food aisle for $2.50 and if you are lucky $2 when specials are on - so make sure you stock up! So if you are feelings a snack that is gluten free, full of raw foods or just jam-packed with sweetness - then this is your go to healthy alternative snack bar. So what are you waiting for - go to your nearest Coles and stock up! Have you tried any of the flavours? Which one is your favourite? I hope that you have enjoyed this style of post and I am sure there will be more to come in the future - so stay tuned! *DISCLAIMER: This post is not sponsored and all opinions are my own. Love Tanya by Tanya Burr :: Book Review. 5 reasons why you shouldn't skip breakfast. 10 things to tell yourself every morning. 10 things that've made me happy this week. Malteser and Chocolate Chip cookie. Banana and Nutella Cake Bites. The perfect last minute Valentines treat. Make the most out of your Mondays.